At EPP, we are proud of our experience and capability to deliver a truly “one stop” service for GLP 5-batch analysis for pesticide registration. We follow a phased process, progressing to the next stage depending on the previous results obtained and provide a full GLP report summarising our findings for submission to the appropriate regulatory body. We have vast experience of hundreds of agrochemical active ingredients. EPP has a great deal of experience tailoring your 5-batch analysis and report to the submission requirements dependent on regulations. You can be assured that client confidentiality is of the utmost importance to us and we have produced 5-batch reports for new products onto the market which have had the first submission in Europe and Brazil. International registration of pesticides also require physico-chemical testing which EPP are able to support. Europe – Regulation (EC) 1107/2009, referencing SANCO 3030/99 rev.4. This is one of our core strengths. Our unique blend of expert knowledge, experience and excellent instrumentation means we offer can easily screen your batches in a semi-quantitative process by GC (FID), HPLC (UV) and ion chromatography to determine those components above 0.06% w/w. At this early stage, our scientists can help you with your next steps. Our scientists then isolate and characterise the impurities found in technical materials. 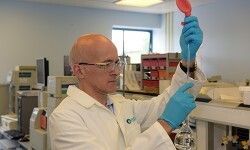 EPP has in house capabilities to isolate impurities from the technical material. We have GC-MS or LC-MS-MS to determine the specific nature of the impurities and if the compound is non-ionisable we have our own in-house NMR to aid with structural elucidation. Most CROs will obtain reference standards from other labs, however EPP can help you save time and money by providing analytical reference standards from our own synthetic lab. All analytical reference standards are certified in house by using chromatographic purity. In addition, the standards can also be certified to GLP if required. There are certain compounds, particularly those containing phosphorus, such as glyphosate, fosetyl and ethephon which are difficult to certify by UV and therefore we can use qNMR to certify. Overall, our integrated labs help to prevent delays and we can ensure quality. We have experience of over 200 actives and we have many of these reference standards in stock. 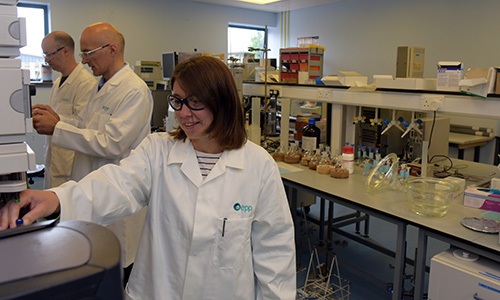 We can develop accurate, precise and specific methods of analysis for use in a variety of analytical applications including impurity assays and active assays. There may be cases whereby there is no CIPAC method is available or it is an older CIPAC method which is not fit for purpose any longer, EPP’s team of analysts can easily develop new robust chromatographic methods. In addition, methods can be transferred for sponsors’ in-house purposes or used at EPP in GLP regulatory studies. All methods developed are validated within SANCO 3030/99 rev.4 guidelines within the EU and all other requirements of the territory of submission. Using HPLC (UV), GC (FID) and ion chromatography, the quantitative analysis of the active and all other components such as impurities and solvents are determined. EPP has invested in new software on our analytical instruments in order to comply with heightened data integrity requirements made by the MHRA. EPP has excellent in house QA staff who are extremely experienced. As part of strict adherence to GLP, a critical phase of the experimental work must be observed by QA, to ensure all laboratory results can be presented with confidence, quality and integrity. After all the experimental work is completed, a full GLP report detailing all aspects of the experimental work is produced in accordance with the area where submission is required. Even once the experimental and reporting is complete, we are able to assist you further with post-submission support.